Audi Sport Customer Racing will field seven entries in this weekend’s Liqui-Moly Bathurst 12 Hour race, held at Mount Panorama in New South Wales. The Audi teams will be spearheaded by the two Pro class entries of Jamec Pem Racing, which head into the event with two brand-new cars and one of the strongest driver line-ups on the grid. Ten manufacturers are on the grid in the GT3 categories, including eight marques in the Pro Class for professional drivers, who have the best chances of claiming overall victory. “It’s going to be a strong opening event,” says Chris Reinke, Head of Audi Sport customer racing. Since 2011, the Bathurst12 Hour race has been open to GT race cars as well. Audi, as a brand having competed in the event from the very beginning, clinched overall victory in 2011 and 2012, and since then has been the only manufacturer to have triumphed twice. Team Jamec Pem Racing will field two Pro class entries in 2017, and has left no stone unturned in its quest for overall victory. 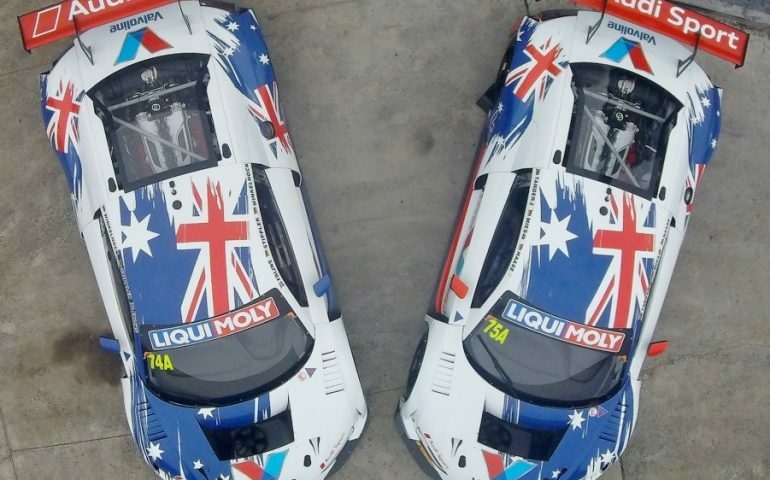 Cars #74 and #75 feature distinctive liveries and are adorned by the Australian flag. “This year, we have two brand-new Audi R8 LMS racecars, and some of the best local and international drivers on the grid,” said Jamec Pem team owner, Steve McLaughlan. Christopher Mies, a two-time winner at Mount Panorama, is sharing the cockpit of car #75 with his German compatriot Christopher Haase, and Australian ace Garth Tander, who has won the legendary Bathurst 1000 touring car race three times. The sister #74 car will be driven by the two Germans, Frank Stippler and Markus Winkelhock, together with Robin Frijns. The Dutchman has previously won a championship title in the Audi R8 LMS. Winkelhock and Stippler have celebrated success in various 24-hour races under the banner of the four rings. Five teams with drivers from Australia and New Zealand complete the Audi Sport customer racing lineup. They include Greg Taylor and Nathan Antunes from Team GT Motorsport. Last year, the two Australians clinched victory in the amateur class at Bathurst, when the new Audi R8 LMS debuted in Australia. For the first time, the regular qualifying session will be followed by a shootout for the top ten grid positions. This competition, as well as the full race on Sunday, will be broadcast live on 7mate. Coverage of the shootout begins on Saturday at 15:30 AEDST, while coverage of the race itself begins on Sunday at 05:30 AEDST. Around the globe, viewers can watch live streaming of the race at www.bathurst12hour.com.au. The race begins at 05:50 AEDST (20:00 Saturday February.